Joanna Robbins had done the Parks Half Marathon a few times, so she went to bed feeling like she was ready to help her friend Aaron Zimmerman run his first half. [button-red url=”http://www.zippyraceresults.com/search.php?ID=5222″ target=”_self” position=”left”] Results [/button-red]When she woke up at 7:04, though, she knew there was one thing she forgot—the race started at 7. She thought on her feet, once she got out of bed, and high-tailed it to the five mile mark, courtesy of Ben Levy’s tactical navigation. Zimmerman managed to catch a ride with Robbins’ family and was cruising along, thinking he’d be on his own. “Joanna just kind of pulled up alongside me and merged with me and there she was,” he said. They pair met up with Levy at the eight mile mark and together, the three of them logged 26 miles. “Joanna and I added up to 13 miles, so that’s pretty good,” Levy said. The trio were among nearly 2,000 runners who made the trip to Bethesda through Rock Creek Park from the Rockville Metro station. Andy Weaver, of Baltimore, was the first, coming away with the men’s win in 1:08:15, running most of the race alone, the second year the race has been bereft of East African competitors in the front. “I was expecting some more people because prize money has a way of bringing people out, but I’ll take it,” he said. Weaver recently moved to Baltimore from Delaware, following four years running for the University of Delaware, until the school cut its varsity cross country and track programs. He finished his eligibility at the University of Oklahoma and works as a civil engineer, running for the Falls Road Running Club. “I thought this race would be a good place to check on my fitness before the Rock ‘n’ Roll Philly Half,” scheduled for Halloween, he said. With a 1:05:40 PR in the half, he stands a chance of running the U.S. Olympic Trials qualifying standard of under 1:05. He had a healthy lead over Kieran O’Connor and Brian Flynn, who ran 1:11:37. O’Connor planned to run the race a little easier, until early on when he saw the chase pack was not moving as fast as he expected. D.C.’s Tezata Dengersa took the women’s crown in 1:20:10, ahead of Baltmore’s Nicole Wilson in 1:21:24. Ashburn’s Debbie Casola had run the Parks Half’s predecessor, the Marathon in the Parks, but had never tried the half until her son, Daniel, voiced his interest in running it. That it was. After a hot and muggy week, mostly clear skies and temperatures in the low 60s greeted the runners, with a slight sprinkle in the middle of the race. “I thought I was crying a little earlier than normal in the race,” said Mike Katz, of D.C.
Missy Park, of Arlington, was running her ninth Parks Half, and by now she’s running on autopilot, but enjoying the race just the same. “These days I know I can run the distance, but I don’t train as much,” she said. “I just accept that I won’t be as fast, but when you have a nice day, it doesn’t matters as much. 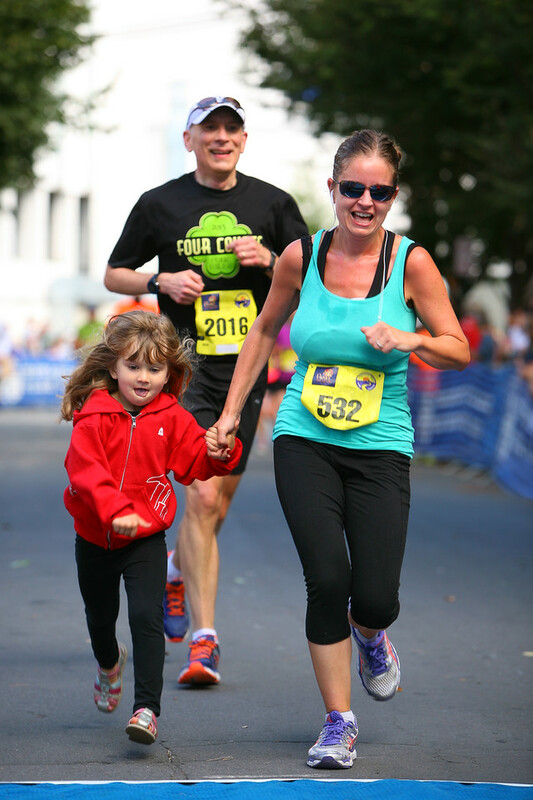 Bethesda native Sean O’Leary relished the chance to run his first Parks Half . Mike Cole, of D.C., on the other hand, didn’t realize how fast he was going, because he consciously left his watch at home and didn’t start his running app on this phone. At which point, he noted that he had run a 14-minute personal best. His half marathon prior, he had also run about 14 minutes faster than his first. He appreciated the support along the course from spectators, but observed a difference from other races. Marathon veteran Shlomo Fishman of Silver Spring chose Parks as his first half. He’s an Montgomery County Road Runners Club racing team member who also trains with the Dojo of Pain.